Early last month I wrote about the connection between comics and popular music, observing that it’s unusual to see a reference to comics invoked in the context of popular music. 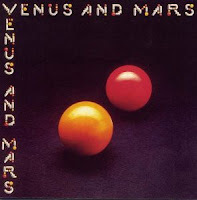 I mentioned that one of the earliest explicit connections I remember between comics and music, revealing that the two could come into confluence, was Paul McCartney and Wings’ “Magneto and Titanium Man,” from VENUS AND MARS (1975), a song about two obscure villains from the Iron Man comics. Many thanks go to my friend Dion Cautrell for finding this information and sharing it with me.